Come summer, New York City lights up and so do its people. Summer in the city means evening drinks on rooftops. After all, there’s no better way to take in the gorgeous views of this quintessential great American city than from one of its rooftops. That said, here are our recommendations for the best rooftop bars to visit during your stay at The New Yorker Hotel. The epitome of New York rooftop experiences has to be Bar SixtyFive at the Rainbow Room in 30 Rock. 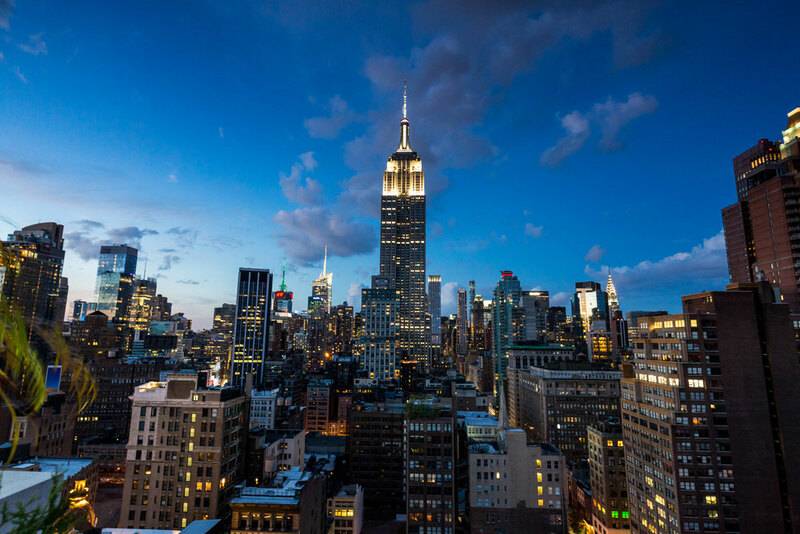 Not only is it an iconic New York spot, it’s also the highest rooftop bar in the city. Here you can get 360-degree views of the city and also birdseye views of 30 Rockefeller Plaza. However, with the hype comes a long wait list. We suggest you make your reservations well in advance. One of the most popular rooftop bars on this list, 230 Fifth Avenue, has become a household name in the city, starting with its view. Here you’ll find a front-row seat to the Empire State Building as well as one of the largest outdoor roof spaces a New York bar can offer. It also has more of a “club” vibe than the rest of the bars on this list, so expect loud music. 230 Fifth does have the reputation for attracting tourists, but then again - THAT VIEW. Now, if you’re looking for a much quieter, more laid-back type of rooftop, the Met Roof Garden Bar is one of the city’s best hidden gems. One wouldn’t normally think of heading to a museum for the outdoor view and drinks, but the roof at the Metropolitan Museum of Art not only offers great views of the New York Skyline from the Upper West Side but of the canopy of trees over Central Park as well. It’s a perfect end to an excellent museum day. This is one rooftop bar that’s almost as gorgeous as its view. While Skylark is one of the newer additions to the NYC rooftop scene, it’s wasted no time in climbing up the ranks. Here you can catch gorgeous views of Midtown, as well as some tasty (and upscale) bar bites. However, the true star of the show is its cocktail menu, which is well worth the price. Because New York rooftop bars have a proclivity for pretension, there’s a nice alternative in Nomad’s Tavern 29. This gastropub brings none of that, save for its amazing menu. Not only is the vibe casual, it also has an extensive beer list (many of which are on tap), and a comfortable rooftop patio. No need to get dressed up. Here it’s all about the good life.